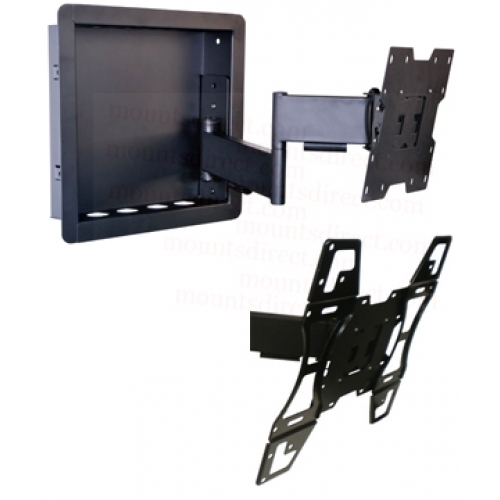 The New In wall Universalmounts Articulating mounts (includes Plates for 100x100, 200x200 and 400x400) are latest and most flexible flush mounts for flat panel displays. The cantilever mounts offer maximum adjustability with a 22" Arm (20" from wall) , including horizontal extension, 180º of lateral rotation, as well as full swivel and tilt capabilities. 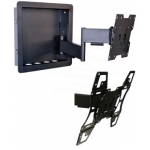 More than just mounting hardware, these cantilever mounts have a tactile quality that enhances the high technology aspects of any flat panel installation. This unit may not be compatible with all 55" LED TV. Please check with us if there any questions. Please make sure that the hole patterns on your Tv is not more than 15.75" (vesa 400) apart.